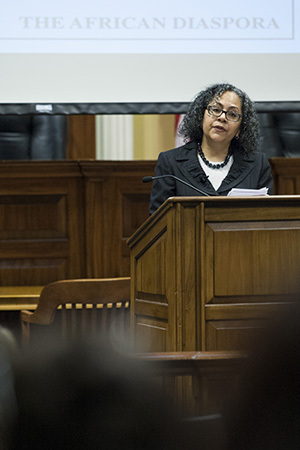 Fordham University law professor Tanya K. Hernandez discussed her book, "Racial Subordination in Latin America: The Role of the State, Customary Law and the New Civil Rights Response," as the keynote speaker for the 19th annual Thurgood Marshall Symposium at Samford University's Cumberland School of Law Feb. 28. The program was presented by the Black Law Students Association. Hernandez (left) said Latin America is a useful context to consider when dealing with civil rights in America. She said approximately 150 million people are of African descent in Latin America, representing about one-third of the total population. Many Americans are surprised to learn this statistic because they believe that the Trans-Atlantic slave trade was primarily a U.S. legacy. She called this a myth, explaining that only six percent of African slaves went to North America while the majority went to Latin America, 38 percent to Brazil alone. Hernandez said many people in Latin America have the view that racism does not exist despite the advent of social justice movements and research that demonstrates the contrary. "Denial of racism is rooted in what many scholars criticize as the myth of racial democracy - the notion that racial mixture in a population emblematic of racial harmony is insulated from racial discord and inequality," she said. This attitude directly affects Latin America's legal system, a system Hernandez called riddled with problems. "Even though the criminalization of racial discrimination suggests a strong normative commitment to the eradication of discrimination, it may be a practical matter that has the ironic effect of making the legal system less capable of dealing with the problem of inequality and discrimination," she said. Hernandez received her law degree from Yale Law School, and has pursued her interests of studying comparative race relations and anti-discrimination law.